Cyclophilin A (CypA) is a host cell factor that is important in multiple pathways during an infection, including inflammation, immunity, and protein trafficking. Improper regulation of CypA plays a role in facilitating cancer, autoimmune disease, and HIV infections. 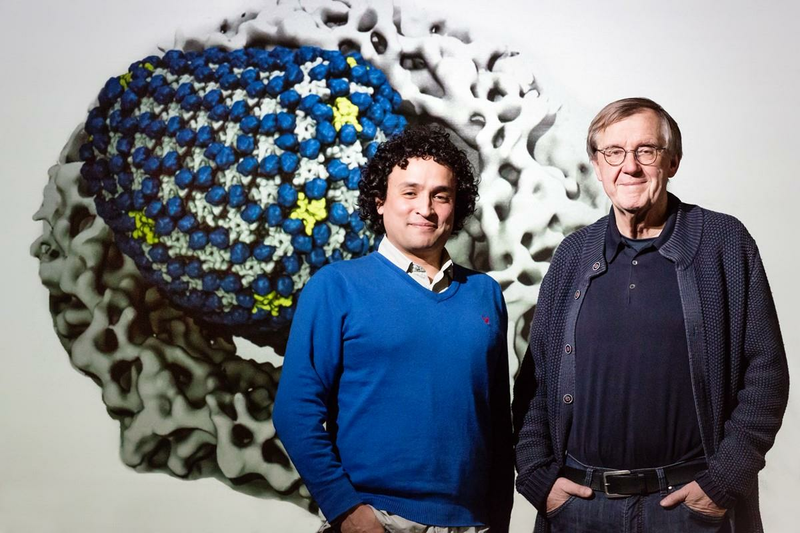 Klaus Schulten, Peijun Zhang, and co-authors used a multidisciplinary approach to discover an interaction between CypA and the HIV-1 capsid protein. By resolving an 8-Å cryoEM structure and utilizing all-atom molecular dynamics and solid-state NMR, the authors unexpectedly reveal a novel capsid binding site on CypA. A single molecule of CypA is now known to bind two subunits of the HIV-1 capsid, resulting in increased capsid stabilization. Identification of this new binding site reveals the possibility for new HIV therapeutics that could target this unique interaction.